I like foods that are crunchy. OK, it is more like LOVE. I LOVE crunchy foods. Yep, that’s more like it. Love. Anything and everything from tortilla chips to carrot sticks. Toast to crisp apples. It doesn’t really matter. If it is crunchy, I will probably enjoy it. I even like the corners of lasagna and the edges of stuffing because it is crunchy. Rice cakes anyone? Crunchy, crunchy, crunchy. So when I ran across recipes for roasted chickpeas and the claim that they were crunchy and healthy…I had to give them a try. I tossed the beans with onion and garlic powder, a bit of paprika and cayenne pepper, and a touch of salt. A spicy snack fit for any afternoon hunger attack. So I have spicy down and a million other combos to go. A simple salt and pepper mix would be good – who doesn’t love salt and pepper chips? Cinnamon and sugar? Why not? Oh the possibilities are endless! 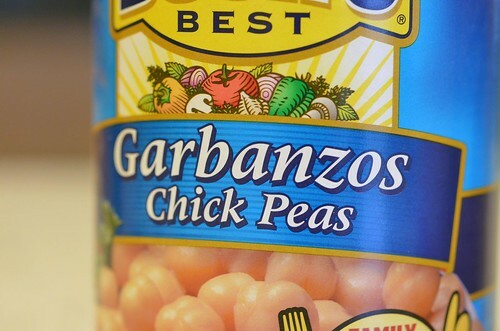 2 Can Chickpeas (Garbanzo Beans) 15 ounces cans, drained and rinsed well. Preheat oven to 400°F. Line a baking sheet with tinfoil. 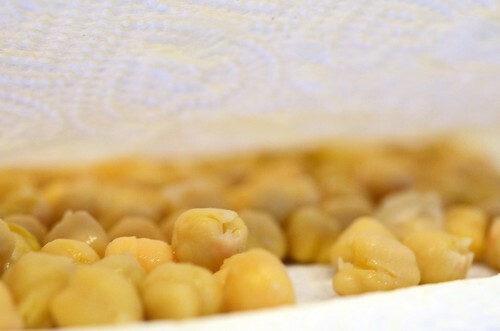 Drain and rinse chickpeas in a colander and rinse until water is no longer foamy. Transfer chickpeas to paper towel lined counter top and gently pat dry. In a medium sized bowl, mix together olive oil and all of the spices. 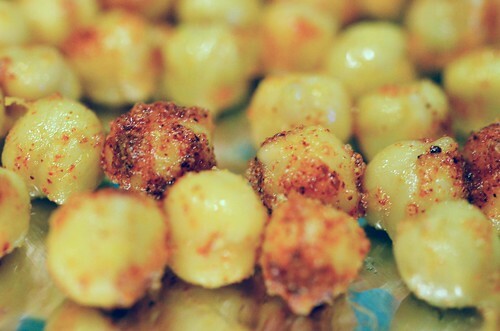 Add the chickpeas and with a wooden spoon or spatula toss the chickpeas in the olive oil/spice mixture to coat. 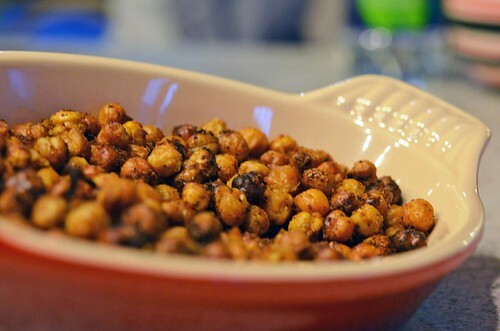 Pour chickpeas out onto prepared baking sheet in a single layer and place in preheated oven for 40-50 minutes. Half way through baking time, gently stir/toss chickpeas and place back in oven to finish roasting. Remove from oven and season with a bit of extra salt (optional). Serve!